In the previous examples we have essentially ignored time by defining models that map inputs to outputs in a single forward pass (e.g., we configured the default synapse to be None). In this example we’ll introduce a simple process model of information retrieval based on this Nengo SPA example. The idea is similar to this example where we encoded role/filler information using semantic pointers and then retrieved a cued attribute. But in this example, rather than presenting the whole trace at once, we will present the input Role/Filler pairs one at a time and have the network remember them. Once all the bound pairs have been added to the memory, we can then query the model with a cue to test retrieval accuracy. First we’ll define a function for generating training data. Note that this function will produce arrays of shape (n_inputs, n_steps, dims), where n_steps will be the number of time steps in the process we want to model. To start, we’ll generate simple examples in which the input trajectory consists of a single semantic pointer presented for some number of time steps, and the desired output trajectory involves maintaining a representation of that semantic pointer for some further number of time steps. Our first model will consist of a single input node and single recurrently connected memory ensemble. The input will present the input semantic pointer for a brief period, and then the task of the model will be to remember that semantic pointer over time. Next, we’ll run the model for the specified length of time in order to see how well the memory works. |#                        Constructing graph                          | 0:00:00WARNING:tensorflow:From /home/travis/miniconda/envs/test/lib/python3.6/site-packages/tensorflow/python/framework/op_def_library.py:263: colocate_with (from tensorflow.python.framework.ops) is deprecated and will be removed in a future version. /home/travis/build/nengo/nengo-dl/nengo_dl/simulator.py:95: UserWarning: No GPU support detected. It is recommended that you install tensorflow-gpu (`pip install tensorflow-gpu`). "No GPU support detected. It is recommended that you "
WARNING:tensorflow:From /home/travis/miniconda/envs/test/lib/python3.6/site-packages/tensorflow/python/framework/op_def_library.py:263: colocate_with (from tensorflow.python.framework.ops) is deprecated and will be removed in a future version. These plots show the similarity of the input/target/output vectors to all the items in the vocabulary. The similarity to the correct vocabulary item is highlighted, and we can see that while the memory is storing the correct item, that storage is not particularly stable. To improve retention we can use Nengo DL to fine tune the model parameters. Training on temporally extended trajectories can be slow, so we’ll download pretrained parameters by default. You can train your own parameters by setting do_training=True (allowing you to vary things like learning rate or the number of training epochs to see the impact of those hyperparameters). WARNING:tensorflow:From /home/travis/miniconda/envs/test/lib/python3.6/site-packages/tensorflow/python/training/saver.py:1266: checkpoint_exists (from tensorflow.python.training.checkpoint_management) is deprecated and will be removed in a future version. Use standard file APIs to check for files with this prefix. We can see that the training procedure significantly improves the stability of the memory. First we will create a function to generate the input/target data for this task. In this more complicated model we’ll add two circular convolution network to our previous memory model, one to convolve the role/filler inputs and one to deconvolve the cued answer from the memory trace. We will use the same metric as in the previous retrieval example in order to assess the accuracy of the system. That is, we will say that the network has successfully retrieved the cued value if the output is more similar to the correct answer than to any other items in the vocabulary. As we can see, the initial retrieval accuracy of our model is poor. We can visualize the model’s output trajectories to see what this accuracy looks like in practice. In all of these plots we are showing the similarity of the input/target/output vectors to all the items in the vocabulary, over time (highlighting the vocabulary items of interest in each case). 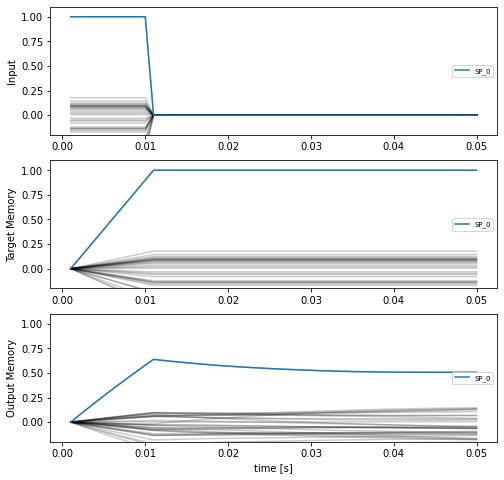 The first three plots show the inputs to the model, and the fourth shows the desired output. The fifth and sixth plots show intermediate outputs in the model, from the first circular convolution network (which computes \(ROLE \circledast FILLER\)) and the memory (which stores a trace of all the \(ROLE \circledast FILLER\) pairs), respectively. The final plot is the actual output of the system, the \(FILLER\) corresponding to the cued \(ROLE\). Ideally this last plot should look like the “Target Output” plot, but we can see that the output accuracy is not great. We can improve the performance of the model by optimizing its parameters using Nengo DL. As before we will download pre-trained parameters to save time, but you can run the training yourself by setting do_training=True. Recomputing our accuracy measure on the test inputs demonstrates that our optimization procedure has significantly improved the performance of the model. We can visualize the change in performance by looking at the same plots as before, showing the model output for one example input trajectory. While we can see that the output of the model is not perfect, it is much closer to the target values (the most similar vocabulary item is the correct filler). You can modify various parameters of the model, such as the number of dimensions or the number of role/filler inputs, in order to see how that impacts performance.